Yesterday I organized the promised livestream part two. I've got a feeling like the picture itself could look slightly better, but it was fun. I added a bot that played music requested by viewers, it was a very wild experience. This transmission was recorded and you watch it here: Link (It will be up for two weeks). I'm thinking of going back to casual streaming of drawing comic pages, maybe some of you would be interested in that? This picture will be uploaded to the official artwork gallery. Yesterday I ran a warmup livestream on my twitch channel to get back to drawing and start working on the comic soon. This is the outcome. 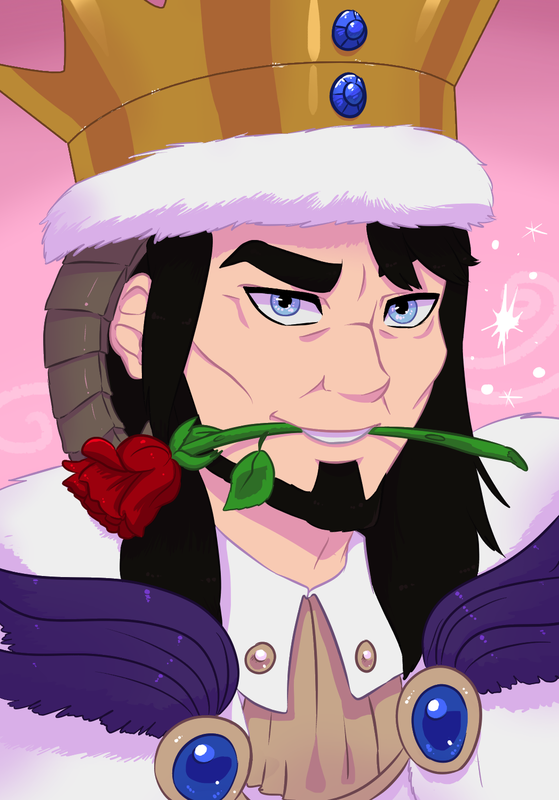 I was thinking of something Valentines Day themed and suddenly a picture of the King of my comic world with a rose in his mouth flashed in front of my eyes. Next week I will probably launch another livestream because I promised to my friend that I will draw his wife too. This picture will be uploaded here. I had great fun on this livestream so if you ever want to request one - feel free to do that. Hey guys, do you like to read about lore? 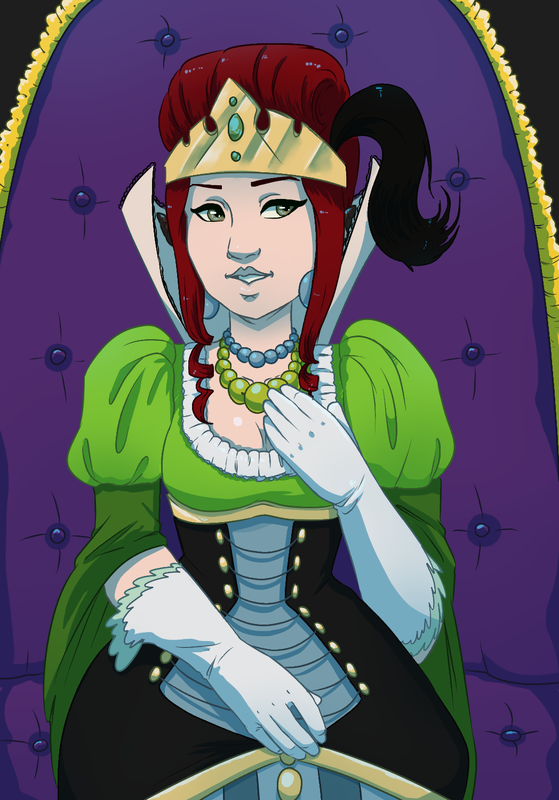 I'm currently slacking adding articles to my comic's wiki, there are some new background details not yet shown in the comic there (not like big spoilers, for example you get to see some info about Riamidea's mount). If you want you can check it out here. This is the place where Luciferimus lives. The red banner is a flag of Hellcephira. Concept art will also be uploaded to the official art gallery. Going back to the subject of the new chapter: chapter number 3 will be called The reunion and it's going to follow the story of Prince Luciferimus and Riamidea (Whom you could see in the first chapter). It sets the ground for chapter number 4 (probably called The trial, but it's not certain yet). I'm not sure when I will go back to the plot of the Great Council of Kreyilon's task yet. If you liked that plot you can also ask me some questions about it or something, but it's a secondary plot, the other one has greater priority. I wrote a new reader's guide and I moved the prologue to deleted scenes in the process. Now the comic starts from the cover of chapter 1 and the new reader's guide takes the place of the prologue. In case if you still want to read the prologue, it's here. I was about to do it a bit later, but I decided to move it today. The poll from my previous post is now closed, thanks for participating. Some of you might know that this current comic is one of many reboots and it's the only successful version. I started this comic way too early and I went through many hardships trying to make it. The way the prologue looks now was more like a draft so that i can sketch the basic concept for you to know what is going on. The thing is, the second chapter is about to end very soon and it opens the plot called "The tale of Parent Time" where the backstory of their world is going to be shown. It's a secondary plot that does connect with the primary plot but it has lower priority and will be used as an intermission between parts of the main story (to connect with it by the end of the comic). Since the backstory is going to be displayed better in the secondary plot, the prologue becomes obsolete. It was already optional, but now I'm considering dropping it. I was thinking of putting a small text guide for newcomers somewhere instead of it. Of course I won't delete it forever, it will still be accessible is a separate place containing deleted scenes (I considered making a new website for it but i may as well just make a gallery for it). The prologue matches the actual comic way less than I thought it will. The art sticks out, breaking the fourth wall might have not been a good choice and generally it feels a bit off to me. I know some people who actually liked that part of the comic, but i also know that some people may find it mismatched and unnecessary so feel free to suggest which way to go. This month I made a dedicated wiki for this comic. Beware, there may be minor spoilers out there.